Videos : Lindholm mocks his former team and their fans after big win on Sunday. Lindholm mocks his former team and their fans after big win on Sunday. I may be crazy but one single player may have just kicked off a serious rivalry between two National Hockey League franchises. On Sunday afternoon the Calgary Flames were on the road in Raleigh, North Carolina as they were set to face off against the Carolina Hurricanes at PNC Arena. Even under normal circumstances this would have been a pretty important game given that the Hurricanes are currently in a tense battle for a spot in the 2019 Stanley Cup Playoffs and the Flames were attempting to cement their stranglehold on first place in the NHL's Pacific Division, but these may not have been normal circumstances. For at least one player it seemed like their was something more personal at stake on Sunday afternoon, former Carolina Hurricanes forward Elias Lindholm. Lindholm was of course traded by the Hurricanes earlier this year to the Calgary Flames as part of a deal that also sent former Hurricanes defenseman Noah Hanifin to the Flames and saw defenseman Dougie Hamilton, forward Michael Ferland and prospect Adam Fox. Well I may be reading too much into this but now with the benefit of hindsight it sure seems like Lindholm came into this game with something of a chip on his shoulder. 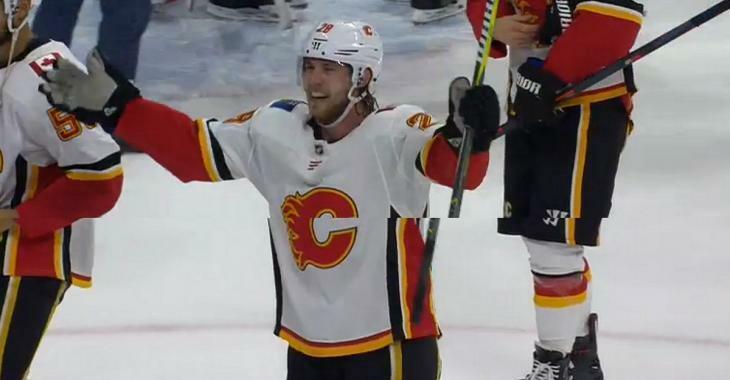 Thankfully for Lindholm the Flames would pick up the win on Sunday, eventually triumphing by a margin of 4 - 3, but the win itself may not have been enough for the possibly disgruntled former Hurricane. After the Flames had already won Lindholm decided that he would add insult to injury by mocking the post game victory celebrations that the Hurricanes have come to be known for this season. Raising both his arms into the arm Lindholm began to mock the celebrations that fans in Carolina really seem to have embraced, which made the mockery from Lindholm all the more effective. Although it initially seemed to go unnoticed, when Lindholm began to do it a second time while leaving the ice you could clearly hear the boos beginning to rain down from the Hurricanes faithful in attendance. Not only has this likely made Lindholm public enemy number one as far as the fans in Raleigh are concerned, but you can bet the Hurricanes players are none too pleased about this either. I for one can't wait to see the next match up between these two sides.